A top prizewinner of the International Paganini Competition, Lynn Chang enjoys an active international career as soloist, chamber musician, and educator. For 25 years he performed as a member of the Boston Chamber Music Society; he has also appeared at the Marlboro, and Tanglewood Music Festivals, and as soloist with orchestras worldwide. He has performed with members of the Juilliard, Tokyo, Cleveland, Vermeer, and Orion String Quartets. His discography includes the works of William Grant Still on New World Records, Made in America with Yo-Yo Ma on Sony, and Grammy Award winning The Girl with Orange Lips with Dawn Upshaw on Nonesuch. In 2010 Mr. Chang performed at the Nobel Peace Prize Ceremony in Oslo, Norway to honor Chinese dissident Liu Xiaobo, and in 2011 for President Obama in the nationally telecast Kennedy Center Awards to honor cellist Yo-Yo Ma. 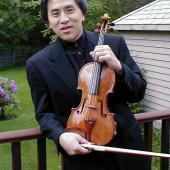 Mr. Chang majored in music at Harvard University and studied the violin with Ivan Galamian at the Juilliard School. His former students now serve as members of the Boston and Chicago Symphony Orchestras, the Los Angeles Philharmonic and the Metropolitan Opera Orchestra. His former student Joseph Lin was recently named first violin of the Juilliard String Quartet. He served as Vice Chair of the Board of Overseers for Harvard University from 2008-2014, where he also served as chair of the Committee on Arts and Humanities. In 2015 he served on the Visitation Committees to the Harvard University Departments of Music and the Department of Germanic Languages and Literatures. For the past several summers he has worked with the Asian Youth Orchestra in Hong Kong, taught and performed at the Green Mountain Chamber Music Festival in Burlington, Vermont, the Heifetz Institute, and the Vivace Vilnius Festival in Lithuania.